I had decided that Ziggy (the Zebu), needed more attention than I was giving him. He was “shacking” up with my 3 young Billy goats & being much bigger than they are, he was definitely the “odd man out”. I felt sad for him – every morning when I brought in their feed, he’d rub all over me and run around like an excited puppy! I put a few ads out for him and wow!!!! The phone never stopped ringing and the emails poured in! I could have sold 10 Zebus! I didn’t want to over price him but I wanted him to find his “forev er” home soon. He was purchased by Ms Pryse in Lenoir City, TN. I believe he’ll be happy at her farm with her family & their horses. Ms Pryse also purchased Buttons, my 6 month old filly. Buttons was by herself in her pasture & I either had to find a buddy for her of her age or sell her to someone who’d work with her and give her the attention she too needed. 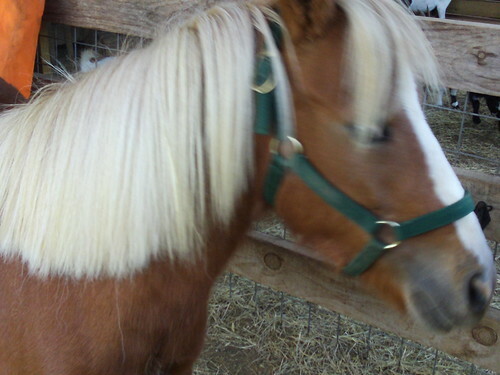 Our county (Rhea County), has annual fair and I was invited to bring my petting farm or to offer pony rides with my new set up. Tuesday, September 9th I spent the afternoon offering rides on Coquette, Ol’Blue, Buddy & Toffee with my beautiful blue & yellow carousel. Toffee being less than 2 years old can’t bear the acceptable 60 lbs child but could carry babies 25lbs & less. My mini horses performed like pros! Everything went very well although it took a few turns for them to fully understand what was expected of them. Towards the end of the event, we got really busy & Toffee had no “clients” but there were several children in line. That’s when I realized that I needed another full size miniature horse. I found “Glory” in Corryton, TN on Wednesday but she needed to integrate the herd & of course get some carousel training. She’s a beautiful 8 year old mare but is a little shy and spooks a little bit also. I’m not really concerned about it, she’ll adapt and will do very well. The herd is not being all that kind to her but that’s how it is in the horse world. Toffee is sharing her hay flake & so is Ol’Blue & Buddy is very aloof but of course, Ms Coquette is a complete witch with her! Coquette is the “boss” and makes sure everyone knows it. As a matter of fact, I happened to be between her & Buddy at an inopportune time & have 3 huge bruises on my legs. I don’t really know how I got 3 bruises as there were only 2 kicks but I have proof! When we returned Saturday, we didn’t bring Toffee but brought Madigan, one of our miniature donkeys. Well, horses just go round and round and look at the ground and don’t question what you ask of them but donkeys are another beast! Madigan wanted to check everything out, verify where all the sounds came from, lifted her head trying to look over everything… not good for doing rides. Not to mention that Madigan didn’t want to stop and go… she just wanted to go, go, go! Well, that didn’t last long so we just put Madigan in the trailer (it was only for a couple of hours, max). She wasn’t very happy about that and certainly let us all know she was in there! We all heard her pathetic braying! Now I have to practice a little more with Glory, the new mare and make sure everyone knows their places. I’m very proud of my herd. We hadn’t been practicing very long and Tuesday was the first time they’d been exposed to a large group in entirely new surroundings. I feel very blessed to have each and everyone of my animals! I’ve learned that if you’re patient and kind, you can get your little animals to do pretty much anything that you ask of them. As long as you’re reasonable in your demands & expectations. The more time I spend around my animals, the more I realize how little I know! Cattle are not known to become pets but if you treat one like a pet, there’s a good chance he’ll become one… except for Llamas… they’re always aloof!